Dead on! Long article, but great information. Milwaukee resident Greg Johnson switched to vaping three years ago from smoking three-quarters of a pack per day. Since switching, he has stopped snoring, he no longer has sleep apnea and, now that he can bike and walk with ease, he has lost 80 pounds. PHOTO BY MIKE DeVRIES E-cigarettes on display at Madtown Vapor in Cambridge. Researchers tend to agree with the idea that e-cigarettes offer a reduced-harm option for smokers. 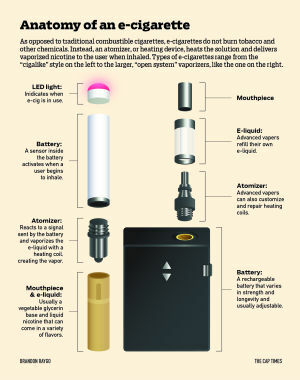 Instead of burning tobacco and thousands of chemicals, e-cigarettes use a battery and atomizer (a heating element with a coil) to heat a solution that often includes nicotine. When inhaled, it delivers vapor, or vaporized nicotine if included in the solution, to the user. “I think there’s no question that taking a puff on an electronic cigarette is less dangerous than taking one puff on a cigarette, because there’s no combustion,” said Stanton Glantz, a professor of medicine at the University of California-San Francisco who researches tobacco control. He said the worry is that dual use can keep people smoking cigarettes, pointing to studies showing that smokers who also use e-cigarettes are about 30 percent less likely to quit smoking than smokers who do not use e-cigarettes. There is some evidence that when used specifically to quit, e-cigarettes can be an effective smoking cessation device, but tobacco control advocates are not ready to embrace them as an alternative quitting method giving the minimal research. Due to lack of regulation, vaping solution, or “e-liquid,” can contain any number of ingredients, but it’s typically limited to five: propylene glycol, which provides the vapor mist; vegetable glycerin, which helps maintain the flavor; various kinds of flavoring and nicotine at varying concentrations (generally 0 mg to 24 mg). Some companies also include water. The varied nicotine levels depend on the preference of the vaper, with pack-a-day smokers often starting off at the higher end and working their way down, sometimes all the way to zero. The ingredients other than nicotine are all considered safe for use in food, but it is still unclear what the effects are when inhaled. That concern is particularly prevalent regarding youth use. In 2014, more teens had used e-cigarettes in the 30 days prior to the survey than traditional tobacco cigarettes or any other tobacco product, according to a University of Michigan Monitoring the Future study. Teens also associated far less risk with e-cigarettes than tobacco cigarettes. It has not yet been determined whether e-cigarette use in youth leads to later tobacco cigarette use, but Glantz said he believes it’s likely. As e-cigarettes and vaping have taken hold, Madison has swelled with shops dedicated solely to selling the necessary gear. Puff Vapor, Mad Vapor, MadTown Vapor in Cambridge, two Infinite Vapors and Hydra Puff Vapes (formerly HufflePuff) are known not just for their sales expertise and product lines, but also as meeting places for vapers to hang out and learn about the newest technology. “I’m not a big drinker, so I don’t go out to bars, but I go out to my local vape shops and hang out and talk and have that social interaction,” said Madison resident Steve Hable, who switched to vaping from smoking three years ago. When vapers move on from starter kits, they can develop technical preferences, adding different size batteries or rebuilding parts themselves instead of buying replacements. Two bestsellers, “Berry Splash” and “Key Lime Cheesecake,” produced vapor that actually tasted like pomegranate and raspberries or key lime. Spinelli mixes the e-liquid or “e-juice” in a back room at the shop, which resembles a lab with its white walls and clean counters. Bottles of flavoring line the shelves, with a different measuring needle meticulously lined up in front of each one. Spinelli has always enjoyed cooking and said the flavor mixing is very similar – for key lime pie, you add brown sugar and lime flavoring. Opponents claim the vast array of flavors specifically targets children, but adult vapers say they also enjoy the variety. “Adults like flavors too,” Spinelli said. Beyond the wall of flavors, different devices stood side-by-side along small, clear shelves lining the walls. They ranged from a $20 starter kit about the size of a pen to a $155 “box mod,” essentially a battery box that delivers more power and longer life. Shops like this are popping up all over the country, but as big tobacco companies start to enter the e-cigarette market, conflict is starting to grow between the two. PHOTO BY MIKE DeVRIESNathan Krey, an employee at Madtown Vapor, makes juice for e-cigarettes at the business. Meanwhile, the tobacco companies benefit most by maximizing dual use of tobacco and e-cigs. Those companies include Altria Group Inc., which makes MarkTen e-cigs; Reynolds American Inc., which makes Vuse; and Imperial Inc., which bought Blu eCigs from Lorillard Inc. in the process of the ongoing Reynolds-Lorillard merger. Those products are referred to as “cigalikes,” the name for e-cigarettes that resemble tobacco cigarettes that are widely sold in convenience stores and gas stations. Reynolds said its position was due to the lack of regulation around open-system tanks and e-liquids, as well as the ability to put substances other than nicotine into the devices, alluding to vape pens that some people use with concentrated marijuana oils. Vaporizer manufacturers and supporters, however, contended that Reynolds was merely trying to quash competition. PHOTO BY MIKE DeVRIESRyan Schumacher adds drops of juice on coils to his e-cigarette at Madtown Vapor. Whether they’ll succeed is unclear, but Wells Fargo Securities beverage and tobacco analyst Bonnie Herzog believes the major tobacco companies will have a “meaningful presence” in the e-cigarette industry as it grows. In contrast with vape shops, they already have high levels of cash to invest, entrenchment with retailers and expertise at building brands. Herzog estimates e-cigarette sales will top $10 billion by 2017 and could overtake combustible cigarettes within a decade. And as the FDA considers how to regulate the growing industry, some think any major regulations could put smaller vape shops out of business. One of the biggest concerns about e-cigarettes and vaporizers has been the quick adoption and growth of the market without regulation or conclusive knowledge about their effects. While places like MadTown Vapor are very clear about the ingredients that go into the e-liquid they produce, there is no regulation on the industry and there is still little conclusive evidence on the effects of inhaling those ingredients. The FDA is currently going through the “deeming” process, which would allow it to regulate e-cigarettes like tobacco products such as cigars, pipe tobacco and water pipe (hookah) tobacco. PHOTO BY MIKE DeVRIESMadtown Vapor owner Dino Spinelli wears a “Keep Calm and Vape” t-shirt. “In the meantime, the marketing is going completely wild and the products themselves are completely unregulated,” Glantz said. While they await regulation, distributors and local or state governments are taking some matters into their own hands, prohibiting sale to minors, labeling nicotine products with safety warnings and adding child-resistant packaging. At least 41 states, including Wisconsin, prohibit sale of e-cigarettes to minors, according to the National Conference of State Legislatures. Minnesota also specifically taxes e-cigarettes and requires child-resistant packaging for liquid nicotine. Glantz also believes the same advertising restrictions as tobacco should apply to e-cigarettes, as well as bans on Internet sales and the requirement of safety standards. In addition to pushes for federal regulation, there is also pressure from the American Nonsmokers’ Rights Foundation and others to add e-cigarettes to indoor smoking bans across the nation. As of Jan. 1, 274 municipalities and three states had laws restricting e-cigarette use in places where smoking is already banned, according to the foundation. Madison joined that list on Jan. 6, adding vaping to the city’s smoking ban for most indoor workplaces like bars, restaurants, offices and stores. More than half of Madison’s City Council sponsored the ban, with lead sponsor Lauren Cnare arguing that the measure isn’t meant to prevent smokers from switching to vaping. She said they merely need to do it in places where other people aren’t subject to the secondhand vapor. Council member David Ahrens, who has worked in tobacco control for 15 years, voted against the ban. He pointed to e-cigarettes’ potential as a smoking cessation device and the still-unknown effects of secondhand vapor. As researchers work to learn whether any “known harm” exists, many vapers are personally urging smokers to switch over. Hable uses an advanced tank and vaporizer system that sticks out in a crowd. People see it and ask questions, so he shares his own experience of switching — the lower blood pressure, the easier breathing, the ability to decrease nicotine levels. While he started at 24-28 mg of nicotine in the liquid, he now often opts for no nicotine at all, or at most 6 mg.
Johnson, too, has cut back to nicotine-free vaping. “The only reason I keep vaping now is because I enjoy it,” he said. But even major supporters are hesitant to promote use of vaporizers with nicotine among non-tobacco users, an arena that has researchers and health professionals most worried. He said one of the key questions is how to construct a policy environment in which smokers who want to use e-cigarettes as a way to quit smoking can get them without having them out there appealing to kids.